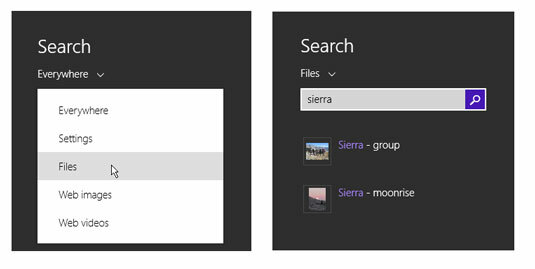 1To search for a misplaced file, begin on the Start screen. 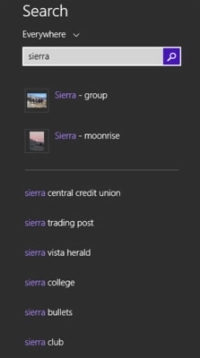 Type the name of a document or photo you have on your computer. The search results panel appears. To search using a touchscreen, swipe from the right edge to display the charms bar. Select the Search charm. Select in the search box to display the virtual keyboard. 2If you don’t see the document or photo you want, narrow the list of items by opening the Everywhere drop-down menu and choosing Files. Initially, the search panel shows settings, files, web images, and web videos in the search results. 3To open a file found in Step 1 or 2, select that file. Mouse: Move the mouse pointer to the top of the screen. When the pointer changes to a hand symbol, click and hold down the left mouse button. Drag the app down until part of the app is off the bottom of the screen. Then release the left mouse button to close the app and return to the Start screen. Touchscreen: Swipe down from the top of the screen until part of the app is off the bottom of the screen. Then lift your finger to close the app and return to the Start screen. Strictly speaking, if you find what you’re looking for, stop looking. (No extra charge for pearls of wisdom.) In this case, however, keep looking because doing so reveals important information about how files are organized and how you can take control of that organization. 4On the Start screen, select the Desktop tile. On the desktop, select the File Explorer icon (the yellow folder) in the taskbar. File Explorer opens. Note the ribbon, which is the collapsible toolbar at the top of the window. To expand the ribbon, select the up arrow at the far right of the tabs. Collapse the ribbon by selecting the down arrow. Select a tab to display its tools, whether the ribbon is expanded or collapsed. 5Select the box labeled Search (probably followed by This PC), below the ribbon and to the right. Type the same search term you used in Step 1. 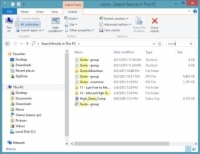 As you type, File Explorer displays any matching files, highlighting the text that matches. The figure shows the results of a search on my computer using the search term sierra. On a touchscreen, the virtual keyboard doesn’t appear on the desktop until you select the keyboard icon on the right side of the taskbar. If the search results include too many files, making it hard to see the one you want, type more of the file name in the Search box. The number of matching files should decrease as you type more text in the box. 6To change the focus on your search to the Pictures folder, select the Pictures folder in the Navigation pane. 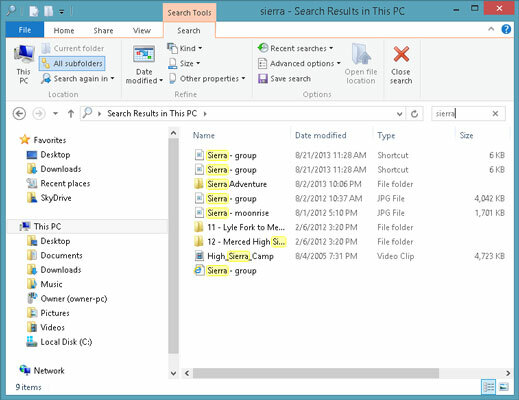 The focus of a search — where File Explorer searches — determines what files and folders are found. 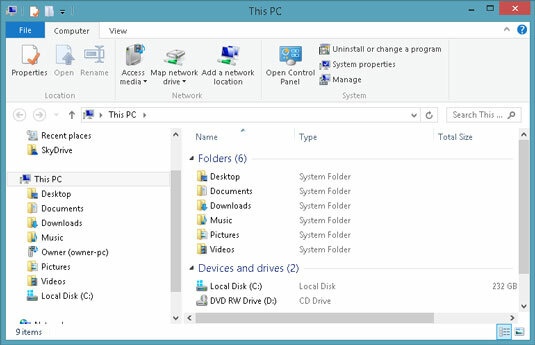 Because File Explorer opens with the focus on This PC, your initial search looks for files and folders throughout your computer. Then select the box labeled Search, select the Current Folder button, and enter your search term again. 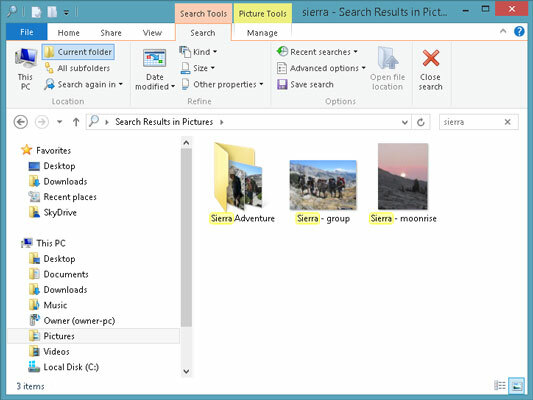 The search results focus on files in the Pictures folder. You can use Search Tools in the ribbon to refine a search, as needed. Start a search, and then select the Search tab. In the section labeled Refine, select Date Modified and then select a time period ranging from Today to Last Year. 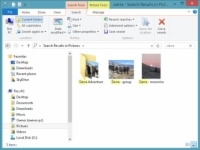 Select Kind to limit the search to specific types of files. You can even select by size and other properties.